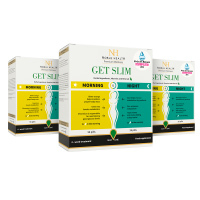 3x Get Slim Morning & Night - Natural dermocosmetics and dietary supplements. Collagen creams. It boosts energy2) and stimulates metabolism to work and burn fat1). 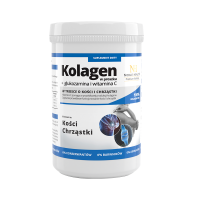 A product recommended in independent tests of the consumers of Women’s Health as a support of effective weight reduction. 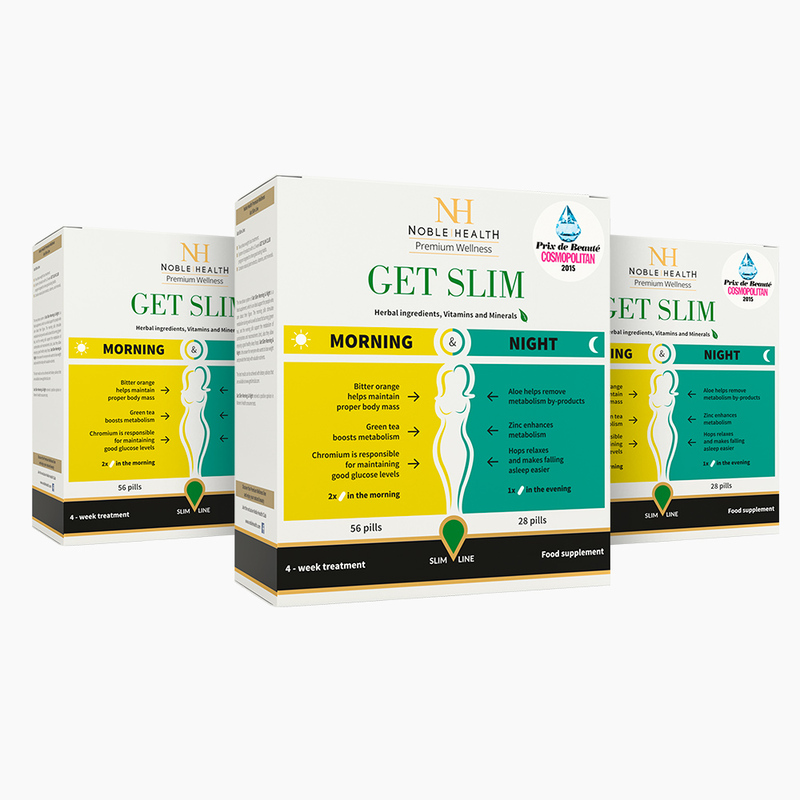 Get Slim Morning & Night is a dietary supplement for those who watch their weight. 1)Green tea extract – supports metabolism and burning of fats. Cayenne capsicum extract – supports reduction of body weight. Chromium – contributes to maintaining proper glucose levels in the blood and supports normal metabolism of macronutrients. Vitamins B6 and B12 – crucial to healthy metabolism of homocysteine. Additionally, vitamin B6 aids in proper synthesis of cysteine. Bitter orange – supports maintaining appropriate body weight as well as metabolism of carbohydrates and fats. Aloe Vera – has a beneficial effect in fatigue, stimulates metabolism, supports processes of removing by-products of metabolism (detoxifying effect) as well as proper functioning of the immune system. Hop – has a relaxing effect, supports optimal relaxation, falling asleep and healthy sleep. Riboflavin, thiamin and vitamins B6 and B12 – support proper energetic metabolism. Zinc – helps to maintain proper metabolism of carbohydrates, fatty acids and other macronutrients. 1.Who is Get Slim Morning & Night designed for? Get Slim Morning & Night is a dual phase dietary supplement recommended especially for those who wish to take care of their weight and provide the organism with valuable substances. Day pills boost energy and stimulate metabolism to work and burn fat (green tea and green coffee). Night pills influence metabolism of carbohydrates as well as macronutrients (zinc) and improve the quality of sleep (hop). Due to the content of caffeine, the supplement is not intended for people with cardiovascular diseases. It is not recommended for children and pregnant women. 2. What’s the composition of Get Slim Morning & Night? Get Slim Morning has the following composition: anti-caking agent - microcrystalline cellulose, green coffee leaf extract (Coffea L.), green tea leaf extract (Camellia sinensis O. ktze), bitter orange extract (Citrus Aurantium L.), Cayenne capsicum extract (Capsicum annuum), potato starch, anti-caking agent - magnesium salts of fatty acids, vitamin and mineral mixture (pyridoxine hydrochloride, cyanocobalamin, chromium (III) chloride); anti-caking agent – silicon dioxide. Get Slim Night has the following composition: anti-caking agent - microcrystalline cellulose, field horsetail extract (Equisetum arvense L.), European hop cone extract (Humulus lupulus), glucomannan (konjac mannan), spirulina (Arthrospira platensis), vitamin and mineral mixture (zinc citrate, riboflavin, thiamin mononitrate, pyridoxine hydrochloride, cyanocobalamin); potato starch, powdered Aloe Vera juice (Aloe barbadensis L.), anti-caking agent – magnesium salts of fatty acids), anti-caking agent – silicon dioxide. 3. How do the ingredients of Get Slim Morning & Night act? Due to a unique formula based on plant extracts, vitamins and minerals, Get Slim Morning & Night ensures appropriate dose of energy for the body thus stimulating metabolism to work and burn fat quicker. 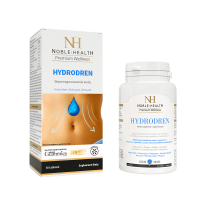 A dual phase night-and-day formula accelerates the process of getting slim and losing weight. 4. How to use Get Slim Morning & Night? Take 2 pills of Get Slim Morning preferably in the morning after breakfast and 1 pill of Get Slim Night in the evening before going to sleep. The pills should be taken with water. Do not exceed the recommended daily dosage. Dietary supplements should not be taken as a substitute for a varied diet. A balanced way of nutrition and healthy lifestyle are key in keeping you healthy. A recommended daily dosage ensures beneficial effect on health. 5. How to store Get Slim Morning & Night? Get Slim Morning & Night should be stored at a room temperature in a dry place, out of reach of small children. 6. How many pills does a package of Get Slim Morning & Night contain? The number of pills contained in one package of Get Slim Morning & Night is enough for a 4-week supplementation. 7. What’s a net weight of Get Slim Morning & Night. Get Slim Morning & Night has a net weight of 73.4 g.
Ideal! Now in the one package it's already mega comfortable :) I took part in the Women's Health campaign and I lost 7kg and kept the result! I use Get Slim Line. Products reduce appetite. At last I stopped snacking :-). In combination with the exercises I see effects. I take the entire set for a 3 days. I do not want to eat at all, and I had a problem with snacking and eating large portions. Super set! I used it last year and it helped me at this price I will take again to be ready for the summer. I love the Noble Health policy! They give women what they expect. Nothing just use and enjoy the silhouette. I'm losing weight! Hi, I've been using it for a month and for the moment I see that my stomach is slightly flat and I have less desire for sweets. The weight is the same but it is probably about size and not weight ;) Who else uses it? For me the revelation, I take for a week, I feel light, lost on weight about a kilo, and eat as much as always.Super, I recommend. One of the best slimming kits I've ever used, and there were a lot of them ... I used a higher shelf products, but none gave the same effect as this one. I give 5 stars to get slim not only because I lost 5 kg but I have more energy (probably green coffee effect) and it improved my complexion. I did not practice much 1-2 times a week, yet I feel lighter in size :)). Hello! I got to Noble Health trough my work colleague. I've been slimming for almost 4 months, but the weight dropped slowly or stood still. Encouraged by the positive reviews I ordered the supplement get slim line. I sincerely admit that I did not believe in the results, but wrongly. After a month I lost 5 kg and the weight is still maintained. Finally, I feel sensational in my own body.